We salute all who have served and fought bravely for our country. You have made the ultimate sacrifice to preserve our freedom, and we could not be more grateful. Your selflessness and courage does not go unnoticed. 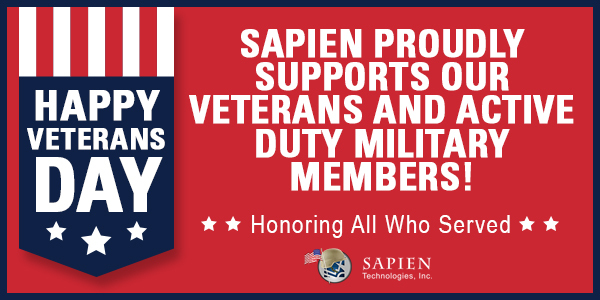 We would like to remind you that SAPIEN Technologies, Inc. supports our veterans and active duty military members 24 hours a day and 7 days a week, with 30% off all software and elevated support purchases. Those eligible for the discount include current, former, and retired members of the United States Military, National Guard, and Reserves. Help us continue to spread the word. If you know someone who could benefit from this offer, please send them our way! Proof of status or a military ID is required. To take advantage of this discount, please send all requests to sales@sapien.com with appropriate verification requirements. Our offices will be closed Monday, November 12th, 2018 in observance of Veterans Day, so any requests sent to our SAPIEN Sales Team on this day will not be addressed until Tuesday, November 13th, 2018. This offer is not available through Resellers, and it cannot be combined with other discount opportunities.